The World Vegetable Center Genebank maintains the world’s largest public vegetable germplasm collection with more than 61,000 accessions from 155 countries, including about 12,000 accessions of indigenous vegetables. Collecting and conservation work is done in collaboration with national partners who maintain duplicate collections. Molecular characterization and genetic diversity analysis of selected collections are done to identify markers and map genes linked to important agronomic traits such as disease resistance, stress tolerance, or high nutritional value. This significantly enhances the efficiency of breeding programs as key genes can be identified for introgression into improved lines. 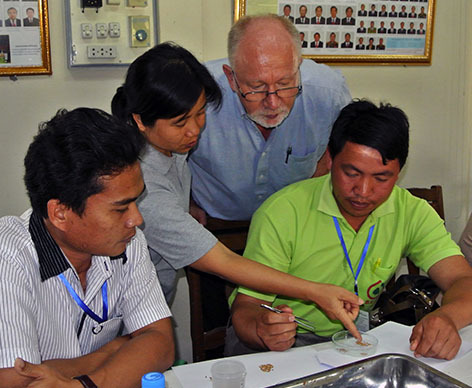 Since its founding, the Center has distributed more than 600,000 seed samples to researchers in the public and private sectors in at least 180 countries. This has led to the release of hundreds of varieties throughout the world, especially in developing countries. The World Vegetable Center Genebank is part of Genesys — the global information and germplasm exchange network. Live genetic resources such as seeds or tissues that are maintained for the purpose of animal and plant breeding, preservation, and other research uses. The Vegetable Genetic Resources Information System contains data on all the accessions held by the Center. This data resource is used by our staff to manage the collection, and by our partners to assess and order materials for their breeding programs. 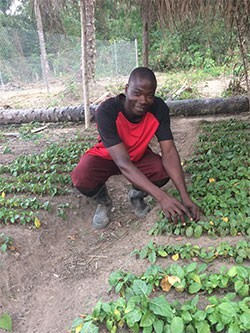 The Center uses standard Material Transfer Agreements (MTAs) for sharing genetic material and provides training to partners in the conservation and evaluation of vegetable genetic resources. The accession number and data recorded when the sample was originally collected (crop accession number, genus, species, altitude, collecting location, etc.). These data were received from the seed donor together with the germplasm. The morphological and agronomic descriptions of an accession (hypocotyl color, corolla color, plant growth habit, fruit size, seed color, etc.). These data were observed and gathered at AVRDC’s experimental fields by staff in the Genetic Resources and Seed Unit or by national partners. The data results of screening accessions for their resistance to different pests (i.e. melon fly, cotton aphid, etc.) and diseases (Bhendi yellow vein mosaic virus, Tobacco mosaic virus, etc.). It also includes nutritive value (vitamin A, vitamin C, antioxidant activity, etc). The Center’s scientists and colleagues at other research institutes conduct the screening.